As more photographers begin to shoot video, they often find it to be a wholly different animal. They find themselves restructuring the way they approach a shoot and perform subsequent post-processing. While this is often seen as a technical challenge, it is really more of a conceptual challenge. With still photos, photographers have had several years to establish systems for naming files, and folders, and develop patterns for editing images. They are comfortable preparing and delivering shoots to clients for incorporation into a page layout or Web site. Not so with video. Video footage requires greater storage capacity and faster computers, and orchestrating even a simple video project requires the assembly and organization of scripts, sound files, video clips, still photos and graphics. Wouldn’t it be great if we could take a peek at someone’s workflow who has it all dialed in and learn from their systems? 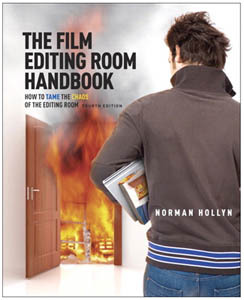 The Film Editing Room Handbook, by Norman Hollyn, provides deep insight into the role of an assistant editor managing the timelines, assembly and delivery of the feature-length film. Although most photographers won’t ever participate in a project of this length and complexity, seeing how a professional editor coordinates all the working parts of a large project makes it much easier to structure the pieces involved in a multimedia workflow. For example, Hollyn stresses that the system, as he calls it, begins before the shooting begins. The editor should meet with all the personnel involved in the production of the film, test the software and hardware systems and begin developing the standard elements (lower-thirds titles, design elements, etc.) to ensure consistency throughout the editing process. Perhaps the most valuable sections in The Film Editing Room Handbook are the two chapters on setting up your NLE (non-linear editor) and organizing footage, sequences and clips into separate bins for easy access. Using his system makes it easy to locate a given clip for addition to your project and to have access to each of the in-progress versions of the film created between the rough cut and the final movie. This is one aspect of multimedia I’ve struggled with as my projects have grown more complex. Using the systems described in the book will certainly alleviate many of the bottlenecks I’ve encountered along the way. Although there are large sections of The Film Editing Room Handbook that a multimedia photographer can safely skim to save time (the technical setup & film standards, for example), the valuable sections on setting up the system will give any photographer plenty of valuable information to incorporate into their workflow immediately.